On August 6, 1945 the United States dropped an atomic bomb on the city of Hiroshima, Japan. It was the first time a nuclear weapon had been used in warfare. There were three strike planes that flew over Hiroshima that day: the Enola Gay which carried the bomb, and two observation planes, the Great Artiste and the Necessary Evil. But most of the 34 crew-members didn’t know that they were carrying the most powerful weapon in the world. Russell Gackenbach was a second lieutenant and a navigator on the Necessary Evil. Today, he is the only surviving member of the mission. Gackenbach’s plane was flying at 30,000 feet above Hiroshima and about 15 miles behind the Enola Gay when the bomb was dropped. 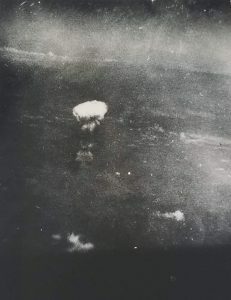 This photograph is one of two images Russell Gackenbach took from the navigator’s window aboard the Necessary Evil, just moments after the bomb exploded. This story was produced by Nellie Gilles along with Joe Richman, Sarah Kate Kramer, and edited by Deborah George and Ben Shapiro. Special thanks to the Atomic Heritage Foundation. This story is part of our ongoing series called Last Witness, which features portraits of the last surviving witnesses to major historical events. Send us your ideas for the series by email or by using the hashtag #LastWitness. 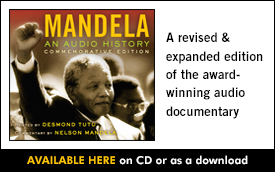 Radio Diaries has support for the Last Witness series from the NEH and NEA, and listeners like you.